Most women suspect that they have a hormonal imbalance. The clues include fatigue, hair falling out, moodiness and more. But figuring out how to rebalance your hormones is a tricky business. In this article, I’ll share some common patterns of hormonal imbalance in women we see in our private clients, and supplements to balance hormones. Without enough phosphatidylcholine, cells quickly succumb to the damaging effects of oxidative stress, causing gut, brain, and liver issues. Unfortunately, research indicates that most people aren’t getting nearly enough of this nutrient in their diets. Read on to learn how supplementing with this nutrient can greatly benefit your health. Are your hormones changing as you get older? Hormones after 40 can be confusing! Listen in to my recent expert interviews, where we discuss instant energy and banishing brain fog, tips for handling a hysterectomy, and hormonal and fertility support as you age. Do you struggle with PCOS, skin issues, or hormone imbalance? Make sure you tune in to these recent interviews as I discuss tips and tricks with experts in each of these fields. Healthy fats are needed for proper hormone production and detoxification. Do you know which fats are healthy? Are you getting enough healthy fats in your diet? Of all of the symptoms that women experience with their menstrual cycles, menstrual migraines are among the most debilitating. Read on to learn what they are and how to avoid them. Herbals vs. Bioidenticals for Hormones: Which Is Better? The question “What do you think of hormone replacement therapy?” is one of the most common I get asked as a health practitioner focused on women’s health. Read on to learn more about HRT and other options. Most conventional deodorants and antiperspirants are a recipe for toxin build-up and hormonal imbalance. Unfortunately, some natural deodorants are a recipe for scaring away friends and may still contain harmful ingredients. Read on to learn how to use healthy deodorant effectively! Do You Have Low Hormone Levels? Though usually undiagnosed, I’d say ‘low hormone levels’ is an epidemic these days. Let’s learn about what that term even means, how you can be diagnosed, and what you can do about it! You may have heard of essential oils, and maybe you already use them. You might be wondering, “how do these really work?” In this article, I’ll explain five ways that essential oils work to powerfully affect your hormones in a positive way! There are several essential oils that have been shown in studies to reduce the stress hormone cortisol. (1) The speed of this reduction is what impresses me! You can feel calmer within seconds of inhaling a cortisol-reducing oil. While you need cortisol for energy, immunity, and inflammation, you don’t need too much cortisol! Your cortisol tends to get high thanks to chronic stress. Lowering excess cortisol with essential oils can help relieve the above symptoms. If stress and insomnia are chronic issues, I suggest using cortisol-reducing oils a few times a day, and especially in the evening as you wind down for bed. Good sleep is important for another hormone, human growth hormone. This hormone helps you repair and rejuvenate at night; it’s how you get ‘beauty sleep.’ So lowering cortisol so you can sleep is key. Common essential oils that lower cortisol are: lavender, basil, rosemary, orange and ylang ylang. The oil blend we use nightly in a diffuser is Serenity by doTERRA. Having excess fat tissue contributes excess estrogen levels. Your fat tissue is an estrogen factory so, like cortisol, you don’t want an excess of body fat. Avoiding processed foods and losing weight is challenging in our busy, toxic world! Luckily essential oils can give you a helping hand to make better food choices and to process calories efficiently. Grapefruit oil is a cravings-buster when you place a drop on your tongue, as is peppermint oil. Grapefruit oil contains D-limonene, a compound that boosts metabolism and drains lymph (bye, bye puffy eyes and water weight). It can also be used externally along with a dry brushing technique to reduce cellulite. The cravings and metabolism blend I use regularly is Slim and Sassy by doTERRA. It has a dorky name but it works really well! It contains ginger, grapefruit, cinnamon, lemon and peppermint. Inhalation of essential oils directly affects limbic system, where you store emotions and memories. Taming negative emotions and painful memories can get you out of the sympathetic dominant mode that inhibits optimal hormone production. Some essential oils help you feel more grounded and others give you a sense of peace. The essential oil cedarwood helps me feel secure and confident, while essential oil of neroli makes me feel euphoric! A product I love that combines several oils in one formula for both acute and chronic indigestion is DigestZen by doTERRA. I try to use in on my abdomen with a carrier oil at least twice a day, and I also inhale it and sometimes use a drop on my tongue. I find the warming and bitter nature of the oils in this formula help me digest a meal and have healthy bowel movements. Inflammation is a process in the body that is helpful and necessary at times. It gathers to do its job when you are injured, when you’re fighting an infection and more. But chronic inflammation presents various problems, one is which is preventing proper hormone production and signaling. Inflammation allows less hormone to attach to receptor sites on a cell’s membrane. This means that hormones may be knocking at the door, but they can’t get inside. With an inflamed cell wall, also toxins can’t get out and nutrients can’t get in. Inflammation also dysregulates the immune system, which can lead to autoimmunity, in which the body is attacking its own tissue. You can use essential oils to lower inflammation, thus allowing your hormones to signal correctly. Lavender reduces the inflammation of a bug bite or a sunburn but also the systemic inflammation that interferes with your hormones. Many oils overlap in their functions; many simultaneously lower cortisol, prevent bacterial growth and lower inflammation. This is because the ‘essential oil’ of a plant protects it and keeps it healthy. Essential oils can provide some of the same protection to you as you endeavor to stay healthy through the changing seasons of life. What I love about essential oils is that they are easy and enjoyable to use. There are some cautions to take, for instance some oils need to be diluted or they will feel hot or burning on your skin. A few oils can make you sunburn easier, so you need to avoid applying them on an exposed area before a day in the sun. With a little education, essential oils are fun and creative to use, and you can reap benefits immediately in reduced stress or a calmer stomach, and you can enjoy long-term benefits in better periods, less hot flashes, thicker hair and more. Join me for this webinar recording, where I explain my favorite ways to balance hormones with essential oils. 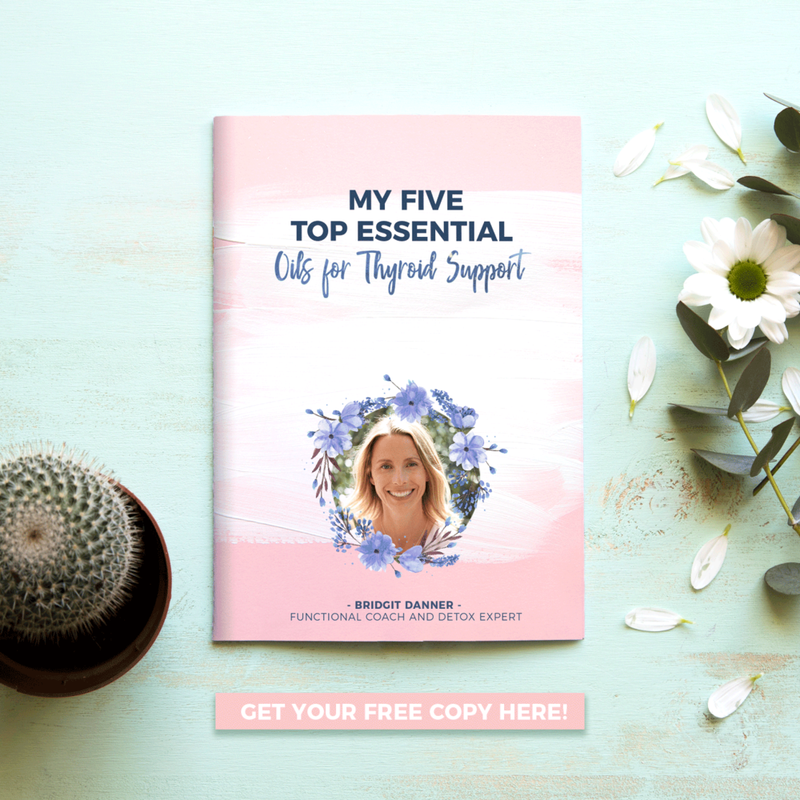 Free guide: You want help for your thyroid symptoms ASAP! Cut to the chase with this straight-forward guide, outlining the exact techniques I use to help keep my Hashimoto’s in remission. Let me help you start addressing your symptoms now! Dr. Mariza Snyder is a Women’s Hormone Practitioner and an essential oils expert. This episode is a recording of a webinar with Dr. Mariza on essential oils for hormones. We talk about perimenopause & menopause, the thyroid, nutritional tips & essential oils. Min 12:10 What are hormones? Is Your Gut Messing Up Your Hormones? Could Your Sunscreen Disrupt Your Hormones? Most types of sunscreen contain toxins that can easily penetrate the skin and cause inflammation, hormone imbalances, and increased toxic burden. Fortunately, there are safer options that still protect from harmful sun rays. Learn how to read your label and discover where to buy safer sunscreen. As we head into summer, it’s important to remember the impact of the sun’s rays on our skin. Though some sun is good for us (hello, vitamin D! ), too much exposure can age our skin, burn us, and leave us at a higher risk for skin cancer. Most of us have likely experienced a bad sunburn and are determined to protect ourselves better this year. So we turn to sunscreen in an effort to keep ourselves safe. But what if our sunscreen itself is dangerous? Most sunscreens on the market contain chemicals that quickly penetrate our skin and disrupt our hormones. Since our skin absorbs much of what we put onto it, we need to guard against slathering ourselves with toxin-laden chemicals. Sunscreen can also provide a false sense of security. Some sunscreens may actually cause more harm than good! Retinyl palmitate - Retinyl palmitate is a form of vitamin A and a popular choice for sunscreen because it is believed to slow skin aging. The problem is this chemical breaks down in sunlight, creating extra free radicals and leading to skin problems, even skin cancer. Additionally, retinyl palmitate is a powerful reproductive toxicant, which is, again, easily absorbed through the skin and can lead to hormonal imbalances. Parabens - These chemicals are included in sunscreens because they delay bacterial and fungal growth. They are, however, also linked to endocrine disruptions, possibly leading to breast cancer and other hormonal difficulties. Again, this is not something we want to be inviting into our bodies! As you might imagine, slathering our bodies with these chemicals throughout the summer can lead to or worsen hormonal imbalance and create a heavier toxic load for our bodies. Fortunately, we have other choices to help keep us safe from sunburn and hormone-disrupting chemicals. When it’s time to apply sunscreen, it’s easy to grab an aerosol can and spray on the sunscreen. However, this can cause lung irritation. To make it easier to use as a spray, the sunscreen is broken down into even smaller molecules that fill the air around us as we spray the skin. We (and anyone else around us) end up breathing the chemicals in the air, giving us even more exposure to the chemicals. Now we get them through our lungs and our skin! The use of aerosols has even been linked to a higher risk of breathing problems like asthma. So if you choose a spray sunscreen, make sure it’s a natural one, and don’t use on yourself or your kiddos if it causes any breathing irritation. Also, realize that a spray sunscreen does still need to be rubbed in to work most effectively! Fortunately, we have many options when choosing how to protect ourselves from the sun! Reapply sunscreen every few hours. Sunscreen does not last all day! Make sure to re-apply frequently if you are out in the sun for long periods of time. Cover up. We can protect our skin by wearing long sleeves, using a hat, and taking other precautions to avoid direct sunlight as needed. Eat a healthy diet. It shouldn’t be a big surprise that our skin will be healthier and less likely to burn quickly when we eat better! Make sure to include healthy fats, antioxidants, and an abundance of vitamins and minerals. Listen to our podcast for more tips: Sun and Sunscreen: Skin Cancer Prevention. This is a great interview with Dr. Keira Barr, a dermatologist with helpful ideas on managing sun exposure. DeVita brand sunscreen offers a Solar Body Moisturizer and a Solar Protective Moisturizer for the face. These sunscreens go on light and smooth for everyday use. My skin is acne-prone and DeVita sunscreens have never clogged my pores. It doesn't feel like you are wearing a sunscreen at all with these products! I apply them on first thing in the morning. In addition to 19% micronized zinc oxide (it’s non-nano), they contain ingredients that support your skin like aloe, grape seed extract and vitamin C.
If you are planning a day at the pool or the beach, you need a stronger product to withstand the elements. When I’m going into full sun exposure, I turn to Beautycounter’s line of water-resistant products. Beautycounter offers a line called Countersun with a lotion, a stick and a spray sunscreen. Beautycounter is always free of synthetic fragrance, parabens, and 1,500 other harmful or questionable ingredients. Their sunscreens are reef safe, so you can take them to Hawaii, and you can even pack the spray in a checked bag! In addition to sunscreen, Beautycounter offers skin care, hair care and makeup that perform like any high-end product, but without disrupting your hormones or exposing you to heavy metals. Grab Bridgit’s list of 5 Easy Detox Swaps for Women’s Health to start clearing out the toxins and reset your system to feel better today! Dr. Eric Osansky is a chiropractic physician, clinical nutritionist, and Functional medicine practitioner. He is back on the show in the event of his new book coming out called "Hashimoto's Triggers". In this episode we talk about Hashimoto's disease & its triggers, the connection between thyroid & SIBO, and essential oils. Min 02:55 What are Hashimoto's triggers? Receive a FREE CHAPTER from Dr. Osansky's book "Hashimoto's Triggers"
Ready to Support Your Thyroid? Check out my free guide on simple hacks for thyroid support! You want help for your thyroid symptoms ASAP! Cut to the chase with this straight-forward guide, outlining the exact techniques I use to help keep my Hashimoto’s in remission. Tami is part of our staff at WWC and joined our online coaching program as a client about a year ago. She's our special guest this week where we talk about her health history, menstrual cycle, negative self-talk, working at WWC among other topics. Grab our Five-Day Detox Guide and get some spring back in your step, naturally. Hormone imbalance can rear its ugly head in myriad ways: fatigue, moodiness, cramps, bloating, headaches and more. But there are some ‘hormone helpers’ available to you that cost just pennies per use and can shift things quickly. I want you to get to know this group of chemicals, as they are probably more ubiquitous than BPA, and a lack of awareness is leaving you literally soaking in a sea of phthalates. Dr. Lara Briden is a naturopathic doctor and the period revolutionary—leading the change to better periods. Her book Period Repair Manual is out on its second edition with new sections on perimenopause, how to come off hormonal birth control and the different options for birth control. In this episode, we talk about the new book, perimenopause, managing heavy periods, and histamine intolerance. Min 04:30 What is perimenopause? Lara's article "The Curious Link Between Estrogen and Histamine Intolerance"
Katie Bessack is a Certified Holistic Health Coach from California. She's also a Corporate Wellness Expert who supports companies through corporate wellness programs. In this episode we talk about some of the fundamentals of self-care for women's health like getting the right kind of fats, finding healthy snacks and getting a good night's sleep.